Modern Warfare 3 is a game with many different modes, but we do co-op here so we have taken a closer look at the Spec Ops and Survival game modes. Both modes have you and a partner join forces to take on enemies that come in many different forms. Spec Ops has 16 very different missions and Survival is Modern Warfare's take on the ever popular 'Horde Mode' and both will have you coming back for more. Stay tuned for our Spec Ops playthrough videos coming out in the near future. How many players does Modern Warfare 3 support in co-op? Can I play split screen in Modern Warfare 3 co-op? Can I play Spec-Ops via LAN? 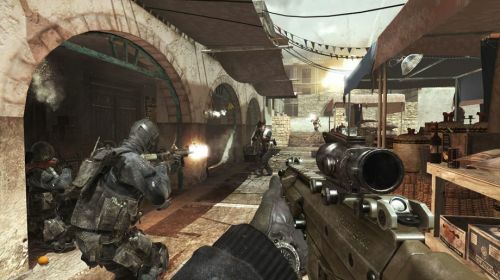 What modes are available for co-op in Modern Warfare 3? What are missions are there in Spec-Ops? How is mission progression handled in Spec-Ops? What does the player level do in Spec-Ops? What guns are available in Modern Warfare 3's co-op? When are they unlocked? What weapon upgrades are available and what level do they unlock at? What air support or perks are available and what level do they unlock at in Modern Warfare 3? What equipment is available in Modern Warfare 3 co-op to unlock? You can play 2 players in either co-op mode, Spec-Ops Missions or Spec-Ops Survival. Yes. All you need is to have another controller plugged in and press start. While the versus supports LAN play, the co-op does not. You can play Survival on 16 maps or Missions on 16 maps. Stay Sharp - Obstacle course where players take out targets. Mile High Jack - Capture the Russian president onboard a 747 aircraft. Hit and Run - Take out two HVT and rescue the hostages. Over Reactor - Capture a Russian sub before it goals nuclear. Toxic Paradise - Suit up as juggernauts and disable nerve agent canisters. Firewall - Hack laptops as one player while the other covers you with remote control turrets. Fatal Extraction - Gather intel dropped by enemies and call in airstrikes on a target. Hostage Taker - Save the president's daughter...stealth not required. Charges Set - More advanced obstacle course. Resistance Movement - Eliminate enemies while rescuing civilians. Little Bros - Destroy Sensitive data before Russians get it, players alternate cover in a helicopter. Invisible Threat - Take out IEDs in a juggernaut suit. Server Crash - Break into an enemy base and steal their master plan. Smack Town - Aerial assault on enemy shipping illegal cargo. Flood the Market - Get the codes in the stock market and then survive extraction on the roof. Fire Mission - One player covers the other in the AC-130 while eliminating an enemy base. Players will earn stars depending on what difficulty they chose for a mission. Completing a mission on normal earns you one, hardened earns you two, and veteran earns you three. After so many stars are earned you'll unlock the next tier of mission. 16 stars is enough to unlock all 16 missions. Spec-Ops has a completely separate player progression system that's very similar to the versus multiplayer. As you play missions you'll earn experience which counts towards your co-op level. Each time you level up you'll earn unlocks which are used in the game's survival mode. These upgrades and unlocks include not only weapons, but upgrades to the weapons as well as abilities to call in like a predator missile or a turret.